Is it possible to represent war without violent images? Erkan Özgen’s “Wonderland” (2016) is about a deaf boy called Muhammed who narrates the story of the last eight years of his home, Syria. I had an only half a day in London, and I was looking forward to see the current shows at Tate Modern, specifically the group show, entitled "Artist and Society," where Turkish artist Erkan Özgen takes part with international artists such as Marwan Rechmaoui, Rachel Whiteread, Joseph Beuys, Catherine Opie and others. The text on the wall shows the intention of the show, inviting audiences to explore artists' ideas about their role in society and share their experiences and thoughts about how art can change the world. This loads a massive responsibility on the shoulders of the artists in the exhibition. I am not sure that each artist in the show accepts this classification. I guess this is an issue for another article. Erkan Özgen is showing his 3 minutes 55 seconds video "Wonderland" (2016). "Wonderland" (2016) was one of the few works I still remember from the 15th Istanbul Biennial. The video is about a deaf boy called Muhammed who narrates the story of the last eight years of his home, Syria. The war in Syria changed the whole region's politics as well as world politics. The boy in the video summarizes the images we have seen from the country with his body language, hands and the sounds he makes. It is quite clear that he doesn't know sign language, but you also don't need to know sign language to understand his story; everything is shockingly clear for spectators that follow events in Syria. Muhammed's gestures start from the initial demonstrations against the regime, then the war, which we know has multiple layers and actors that led to massive destruction and migration in Syria. Images of war and migration are mainly based on images circulating in mainstream and social media. Although these violent and often manipulative images form an important element of public opinion concerning migration and war, they are definitely not direct representations of reality. "Wonderland" tries to answer the question, "How to represent reality? Can we even talk about reality in our time of image cultures?" I think it would be a shame if I don't mention a reference book, Susan Sontag's well-known, "Regarding the Pain of Others," which points out that violent images are an important part of the propaganda used by news systems to manipulate the public and determine the thoughts of viewers and readers. Sontag's book is not only about the meaning and uses of images; she also ponders the nature of war, the limits of sympathy and the responsibilities of conscience. She tries to understand why we like to see another person's pain. Videos, movies and television surround us, but when it comes to remembering something, an image has more impact. Memory is freeze-framed into the basic unit of a single image. Therefore, violent images lose their basis in reality in our minds, and we start to ignore them. Sontag argues, "While an event known through photographs certainly becomes more real than it would have been had one never seen the photographs, after repeated exposure, it also becomes less real." Özgen's work deliberately questions the politics of the image by not showing any mainstream images that generate dialogues for and around sociopolitical subjects within the time of image culture. Our time is mostly defined by image-based culture and we are surrounded by images and our sense of reality is post-produced, and it reproduces itself through our images, screens and social media accounts. The artist conveys questions that concern the impossibility of the representation of violent images and how we interpret them in the time of image culture. 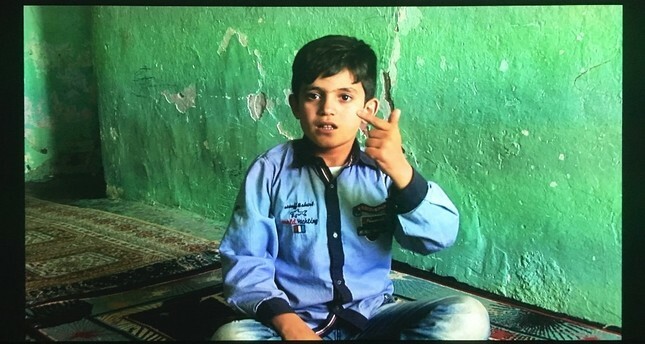 In "Wonderland" (2016), Erkan Özgen investigates the images of current war and migration from the point of view of one of the witnesses, a deaf boy by slapping the work in the faces of those that have closed their ears to the brutality in Syria. He offers a fresh method for those interested in the same subjects and shows us an alternative way to talk about war, conflicts and migration, which I find quite unique. "Artist and Society" can be visited until July 28 at Tate Modern in London.